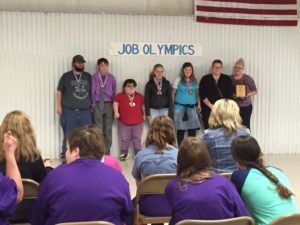 In a unique twist on a proven event, Special Olympics students participated in Job Olympics. Financial support for the event was provided through a grant from the Dane G. Hansen Foundation. Sixty-six students from 12 different school districts competed. Competitions included: automobile check, bagging groceries, day care assistant, drink mix preparation, environmental control, food preparation, gift basket assembly, job application, job interview, kids’ meals, money skills, recycling, rolling silverware, shredding paper, simple assembly, simple construction, small gas engines, sorting mail, stocking/facing shelves, towel folding, vacuuming and waiter/waitress. Members of the community, school personnel and adult service agency personnel served as judges for the day. Medals for first, second and third places and participation ribbons were awarded in each event. Students also received a certificate for their participation in the day’s activities.